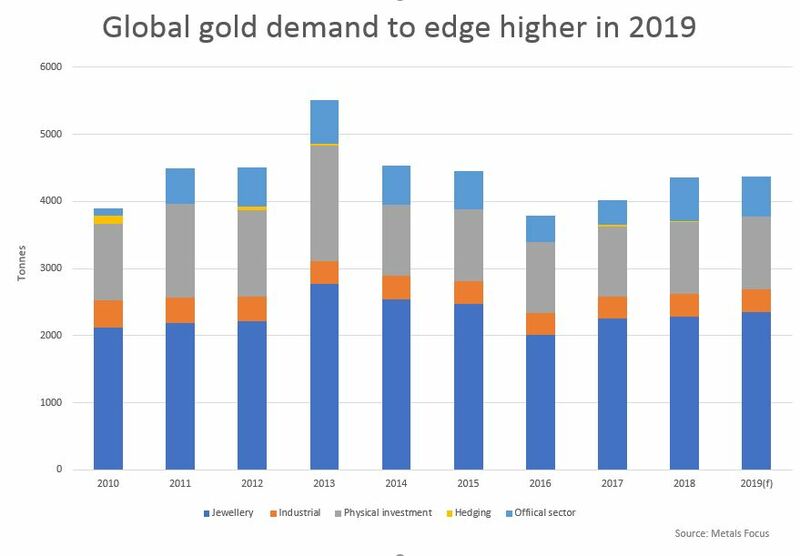 LONDON (Reuters) - Global demand for gold in 2019 will rise to the highest in four years as higher consumption by jewelers offsets a fall in purchases by central banks, an industry report said on Monday. The world will consume 4,370 tonnes of gold this year, the most since 2015 and up slightly from 4,364 tonnes in 2018, consultancy Metals Focus said. Its Gold Focus 2019 report also predicted gold prices would average $1,310 an ounce this year, up from $1,268 in 2018 and the highest since 2013. Gold currently trades around $1,300 an ounce. Gold consumption for jewelry will rise 3 percent this year to 2,351 tonnes, driven by increases of 7 percent in India and 3 percent in China - the two largest markets - which will counter lower demand in the Middle East, Metals Focus said. Purchases by the official sector, which surged almost 75 percent in 2018 as central banks added gold to diversify their reserves, will slip 9 percent this year to 600 tonnes, the report predicted. Physical investment demand will remain largely unchanged from 2018 at 1,082 tonnes. Metals Focus said gold supply would rise by 1 percent to 4,707 tonnes thanks to higher mine production and recycling and some producer hedging. Helping gold prices to rise would be the end of interest rate rises by the U.S. Federal Reserve, along with political and economic uncertainty around the world, Metals Focus said, but it added that a strong dollar would limit gains.